Last week was mental health awareness week. At the start of the week I put together a roundup post, of past Gardening Love mental health articles. Midweek my post focused on what mental health looks like and the stigma surrounding mental health. 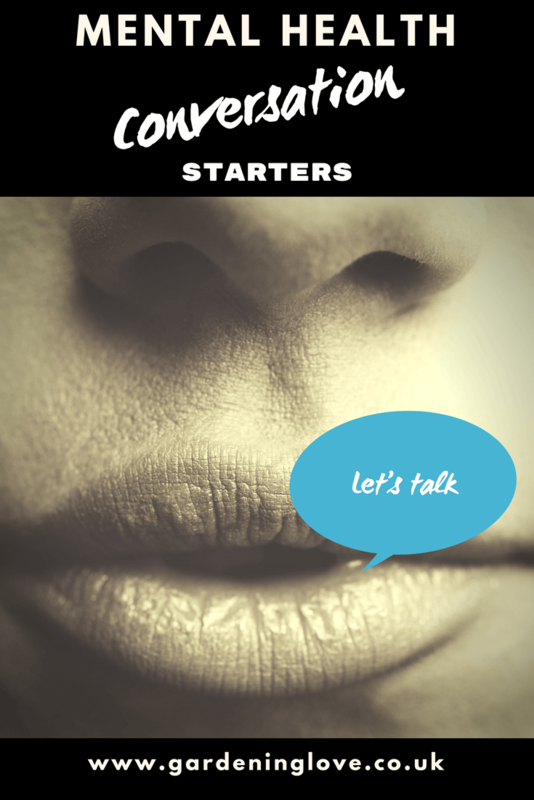 So to end the week I thought it might be helpful to write a post about how to start a conversation with mental health conversation starters. If you feel you are in need of a listening ear, that you need help to talk about your mental health, please check out this post here. If you are hoping to be the listening ear, that you have concerns about someone and want to talk to them about their mental health, then I hope this post will inspire ways to get the ball rolling. We all know what a sensitive subject mental illness is. It’s not the easiest conversation starter and if you want to raise the subject with someone, you may think you aren’t qualified to hold such a conversation. This isn’t true. You don’t need a psychology degree or expert knowledge. No one expects you to have expert medical knowledge, the doctors are there for that. One of the best things you can do is be there for someone, to show that you care and that they have your full attention. The fact that you have noticed someone who might need help is great, now it’s about taking the next step forward and encouraging the person to talk. Mental Health Conversation starters: Top Tips ! Try not to make a massive deal out it. You don’t want them feeling like they are appearing on Oprah ! You don’t need to get them to lie down whilst you make notes ………. you can talk anywhere you both feel comfortable. Going for a walk or doing an activity together is a great way to chat. It may help the person open up more as they wont feel as though it’s an ‘all eyes on them’ situation. Sitting across from each other at a table for instance could feel like more of an interrogation. You want to AVOID that scenario! Don’t always be afraid to ask direct. Depending on the individual, they may appreciate your directness. It is better to get to the point rather than regret not asking the question. It’s so important that you continue to treat the person as you would normally. A person with a mental health issue doesn’t need treating any differently. They are still the same person that you have always known. All you can do is listen and offer your support just as you would do for any other experience that they might go through in life. If face to face is too much for what ever reason then perhaps a text to say you would like to talk, could be a way in ? Perhaps writing a note or letter to them may help. By reaching out and recognising their needs you have made a crucial step forward. The individual now knows that you have taken the time to notice that they may need to talk. They know they are not alone now and that you are there for them. AVOID : The top NO NO’S ! Don’t tell them how they feel. That totally defeats the object. Let them tell you. Don’t share your comparison stories or flip the topic onto yourself. Now is not the time for the “ I knew this guy once who …..” or “I know what you mean, I hate feeling like……..” They need to know that they have your undivided attention. This is THEIR mental health, THEIR opportunity to speak out, don’t take that away from them. Read the situation. If the person is uncomfortable and doesn’t want to talk, please don’t pressure them. They will more than likely close up on you and shut down the conversation. It might not be the right time for them, you must respect that and try to talk another time. Perhaps suggest that you are always there for them and that when they are feeling ready, that you will have a listening ear. Try not to interrupt for the same reasons as in the previous points. Opening up about your mental health is hard. If the person is talking that’s great ! Let them get it out, chances are they may have bottled things up for some time now. Keep them talking. Cutting them off mid sentence and jumping in shows them that your not really interested in what they have to say. They will shut down on you. Definitely do not say anything along the lines of; “ You will get over it”, “Pull yourself together”, “There are others worse off then you”. If there is even the slightest chance that this is your standpoint then might I suggest that you are not the person for the job! Support, encouragement and love is the order of the day! Showing them books and articles you have read. Information leaflets from surgeries and health centres. Online support forums and facebook support groups. Share helpful experiences of your own or others if appropriate and if you truly feel they are useful mental health conversation starters. Tell them about this fab website ( Gardening Love , hint, hint) that you have come across ! I highly recomend this great workbook looking at effective ways to deal with more anxiety based mental health issues, just click this link to read more. I hope you have found this post useful. Please share with those whom might need help. Have you ever expressed concerns for another’s mental wellbeing ? Do you have any advice to share with other readers ? Please comment underneath. These are really great tips! Love how you’ve divided up the post in ‘what to do’ and ‘what not to do’! Great story. Sometimes we just need a little help getting the conversation started and this article is a great place to start from. Thanks for sharing. Hi Becky, these are all great tips when trying to have these kinds of conversations with people. You’re so right about NOT telling other people what their problems are. I’ve always heard that listening is 80% communication. Thanks for sharing!